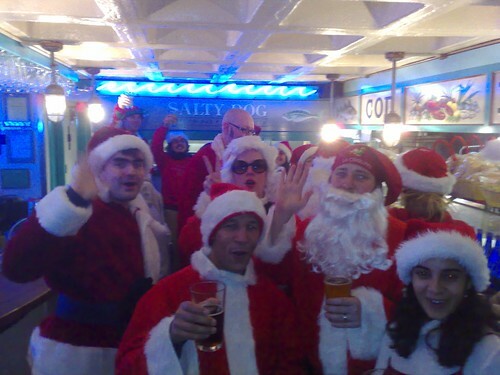 The best pub crawl for people who have Santa suits. Check out the route, if you want to see the a gang of drunkens Noels. I didn't bother listening to the late band, but Cassavettes rock (in their own rootsy way). 3rd Annual "Good Cheer Festival"
This guy lives in Brooklyn but seems to have some serious love for Boston that he comes up for three Christmases in a row to sing holiday tunes, make you sing 'em too, and generally share some positive vibes 'n cookies 'n nog. They'll read some holiday stories ("Gift of the Magi", I hope!) and givae a prize for "best holiday sweater" too. As Jenny (who told me about this show) says, "It all sounds terribly cheesy, but having been to it last year and seen it myself, it's really quite wonderful and unashamedly cheery." It's billed as "PA's Holiday Party". If they hang up some decorations, PA's should leave them up all year. The place could definitely use some livening up besides having darn-good indie-rockitude. Any show with The Konks gets my thumbs up. The Big Big Bucks rock out too. Marvelous big, modern soul and piano pop at the best-kept secret in Davis Square.